Why Is the U.K. Double-Dipping? Great Britain's economy contracted slightly for the second consecutive quarter. Yep, that's a recession. Note, this isn't a huge plunge. It's a little toe-dip. But the implications are bigger. Before Prime Minister David Cameron came into power, his country was recovering at roughly the same pace as the U.S. Since Cameron announced an austerity plan to win the graces of the international lending community, the economy has hit a wall, stumbled forward, and finally fallen flat on its face. 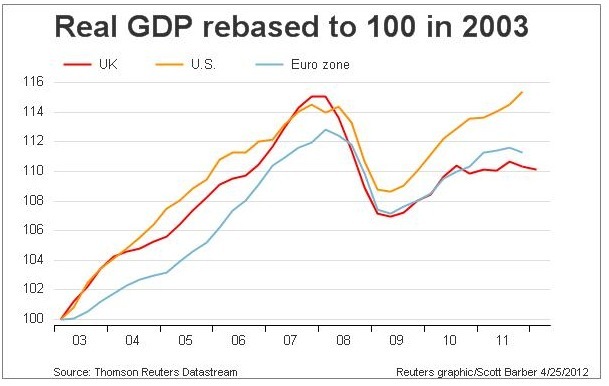 Take a look at this great graph from Scotty Barber at Reuters: Great Britain is now doing even worse than the euro zone it so routinely disparages. What's the lesson here? That fiscal austerity doesn't work without an export recovery to make up the money? Sure. That the Bank of England has failed to stimulate growth expectations in a sagging economy? Sure. But here's the fascinating thing about the UK double-dip. According to UK Office for National Statistics, the sector whose value-added has grown the most in Great Britain since 2008 is ... the government. Huh? How is all this possible? How could austerity be crushing the UK economy while, at the same time, government's value added is growing faster than the rest of the economy? Here's a two-part answer. Part One: The incidence of austerity is having its biggest impact on Britain's disposable income. Reduced transfer payments and higher taxes both count as austerity, but they are squeezing families more than they are squeezing public spending on health care, education, transportation, and defense. As a result, the UK is feeling the pinch of austerity throughout the economy, not just in the sectors conservative consider "public." Part Two: Britain's biggest problem is the EU. The rest of Europe accounts for half of UK exports, and it's been ravaged by the last four years. "What you engage in medium-term budget consolidation while your biggest trading partners are going into a recession, you shouldn't be surprised that the economy is stalling," said Desmond Lachman of the American Enterprise Institute. Austerity or no, the reason why overall production, including manufacturing, and other tradable services are getting crushed is that Britain's trading partners are, well, getting crushed. Update: There's been some confusion over the second graph showing government's value-added component of GDP growing since 2010 even though the British government has been cutting fiercely and shedding 6% of the public workforce. The thing to keep in mind is that much of the UK government -- and much of our government for that matter -- consists of transfer payments for goods and services, and the impact of these cuts is felt in other industries, such as leisure, where demand has fallen. Simon Johnson, the MIT economist and prodigious author, explained over the phone this afternoon: "Government purchases are more or less stable. The government doesn't drop its purchases dramatically like the private sector. If you include education, or the military's multi-year contracts, or severance packages to laid-off public workers, those things prop up government spending." So! The short answer to the question in the headline is: (1) The UK is double-dipping because government cuts are depressing disposable income growth the short run and (2) Austerity works when a small country can export its way out of pain, and the UK's top export partners are falling into recession.